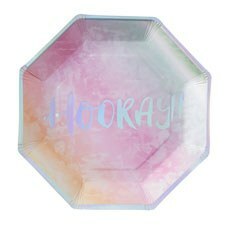 Get pretty paper party plates that are totally on-trend from Weddingstar and easily dress up the candy buffet and tables at your wedding reception, family reunion, baby shower or other event. 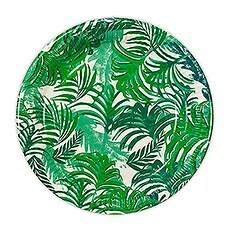 You might not be serving a whole meal at your event, but your guests will still appreciate high-quality paper plates that complement your party's theme and let them help themselves to the sweet treats you have graciously provided. Whether it's fancy petit fours and macarons, trendy individual cakes or homemade cookies, your sweet refreshments will look even prettier on disposable plates that continue the theme of all your other decorations. 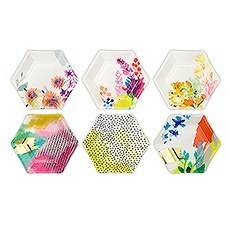 Even those nostalgic candy treats at your candy bar or buffet will be more attractive if guests have a convenient and stylish paper plate to load them onto. 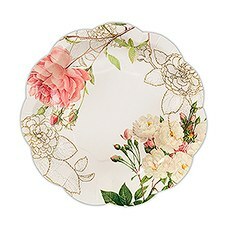 Don't let cheap, flimsy white paper plates ruin the classy look you've put together with all your other decorations. Your on-trend look will be complete with our chic Rose Gold and Navy Hexagon plates that combine a simple geometric shape with the most popular color combination around. 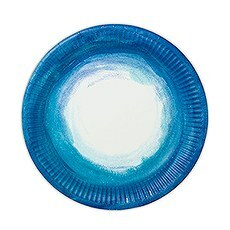 Macarons painted with gold foil or candies in personalized gold foil wrappers will look stunning on these plates. Any garden-themed gathering — from a tea party to a baby shower to a bridal event — will spring to life with our lovely Pink Rose Floral Print paper plates. 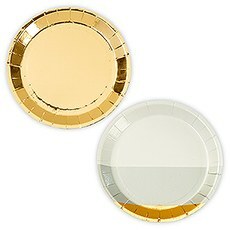 These elegant plates pair beautifully with white china dinner plates, making them a great choice for hors d'oeuvres or dessert. Make a bold statement on the candy buffet at your black-tie anniversary event or New Year's Eve party with the striking look of our Black and Gold Hexagon party plates. The geometric shape and trendy chevron design bring a touch of easy glamour to the sweet treats at your event. Mix and match our high-quality disposable plates with personalized paper napkins for a coordinated look that puts the final touches on your party's theme. Most North American orders over $99 ship free. Prices listed in Canadian Dollar are set selling prices. Prices for all other currencies are generated using daily currency rates and are intended for information. As a result, these selling prices are estimates and may vary slightly. All Content © 2003-2019 Weddingstar Inc.